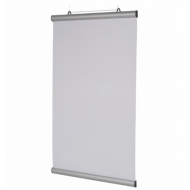 Snap Frames Poster Snaps are silver hanging poster rails which are lightweight snap frame bar lengths which are clamped to the top and bottom of your poster. The top rail has eyelets to allow you to suspend your poster using wire (not supplied), or fix it to a wall. The set includes a top and bottom poster hanging rail. These poster hanging rails can be suspended from the ceiling or easily attached to a wall. Poster Snaps are a cost effective, attractive solution for displaying your graphics. A variety of materials up to 5mm thickness can be displayed. The top and bottom bars snap open to allow easy insertion of your poster. Poster Snaps for holding A1 posters (portrait) 6000mm A1 Snap Frame Poster Snaps which clip open ..
Poster Snaps for holding A2 posters (portrait) 420mm A2 Snap Frames Poster Snaps with Snap Frame ..
Poster Snaps for holding A3 posters (portrait) 3000mm A3 Snap Frame Poster Snaps which clip open ..
Poster Snaps for holding A4 posters (portrait) 210mm A4 Snap Frames Poster Snaps which clip open ..